The long-running and popular Mut Mee is more than just a guesthouse. Average rating 8.5 from 752 reviews. It’s the focal point of a holistic-spiritual-health-conscious community that includes yoga, reiki, astrology and art studios, and the pleasant little Hornbill Used Bookshop, at the end of an alley draped in fragrant flower bushes and charming old houses. 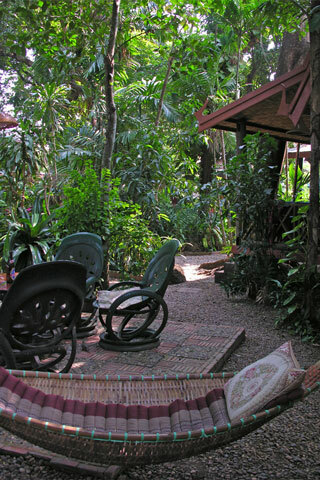 Also not far from the riverside promenade, the guesthouse itself is perched high over the river amid a lush and shady garden that rambles through several roofed salas and chill spaces with hammocks and tables. On any day, you might find two-dozen guests (almost exclusively foreigners) lounging with their laptops. Rooms are set in several different buildings and loads of options are available. The 600 baht air-con double that we checked out was stylish and comfy, with mosquito nets draped over cushy beds, hot water in a partially open-air bathroom and private veranda. We appreciated the thoughtful art and furnishings, though for the price, complementary drinking water should be included. Cheaper rooms rely on fans and basic shared bathroom facilities, while the priciest suite comes with cable TV and a great balcony with Mekong views. Mutmee’s restaurant churns out consistently good eats, and while the staff members we encountered weren’t overly friendly, they do provide maps along with loads of information on the surrounding area. Where are you planning on heading to after Nong Khai? Here are some spots commonly visited from here, or click here to see a full destination list for Thailand.